Learn the creative and meditative process of paper marbling and create your very own set of stationery. Explore paper marbling & letter writing as a tool for connection. Bring yourself, a friend, a date, and discover the possibilities of the process. We'll discuss tips for creating a variety of designs and creating your own marbling set up at home. We'll provide all materials along with light refreshments. 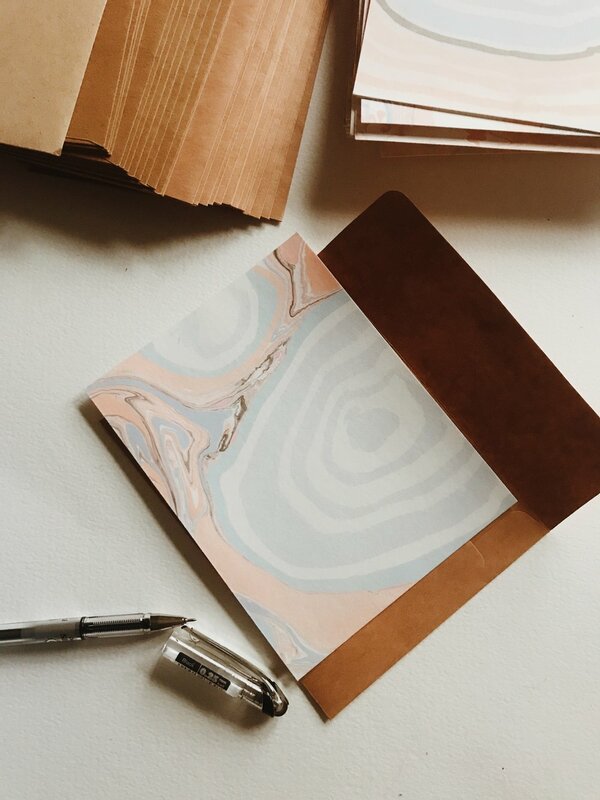 What you'll walk away with: a set of 8 marbled cards and envelopes and extra marbled paper designs and the knowledge of how to continue this process at home. This class is perfect for: anyone and everyone who is interested in creative living. Kelly Odette Laughlin (she/her) is an artist, maker and facilitator from Baltimore, Maryland. Kelly creates programs, experiences, and paper goods which empower people to accessing their innate creativity and wisdom in order to build clarity and confidence in their lives. Combining the practices of paper marbling, bookbinding, writing, movement, and mindfulness, Kelly facilitates workshops and retreats throughout the US that serve as foundations for conversation, connecting to self, and building community. Kelly is also the founder of Odette Press, a small batch book bindery and paper marbling studio focused on creating lovingly-crafted cards and journals that reflect meditation within landscapes, and serve as spaces for healing, reflection, and restoration.